As the result of a board vote on Thursday, the architectural firm Populous is closer to landing the Nashville MLS stadium design contract. Planning continues for the forthcoming Nashville MLS stadium, which is slated to be constructed at The Fairgrounds Nashville for the city’s MLS expansion team. In one of the latest actions relating to the venue, the Metro Sports Authority Board of Directors voted on Thursday to grant preliminary approval to a contract with Populous. The sports authority voted unanimously to authorize the authority’s chairwoman Kim Adkins to execute an agreement with Kansas City-based Populous Inc. after pending language is finalized in the coming days. Finalizing the contract with Populous is still contingent upon ongoing negotiations between Metro attorneys and the firm regarding lingering business and legal terms. They involve final pricing and change-order authorizations, according to Michelle Hernandez-Lane, Metro’s chief procurement officer. The impetus for project leaders to get the board’s vote on the contract now, rather than waiting on those details, is because the stadium has fallen slightly behind its original timeline. Nashville’s MLS expansion bid was formally approved by the league in December, after the Nashville Metro Council decided in November to approve $225 million in bonding for the stadium project. However, there are still additional steps remaining in the planning process. The Nashville Metro Council still has to approve the demolition of existing buildings at the site, and rezoning of the property for an adjacent 10-acre mixed-use development. 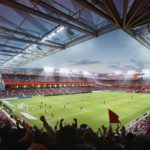 The sports authority, meanwhile, needs to secure a ground lease with the fair board, complete a final stadium lease with the team, and approve a stadium development agreement.